Then his first patient—a down-on-her-luck golden retriever named Frieda Fuzzypaws—wags her way through the door, and suddenly life gets complicated. With the help of a black Labrador gifted in the art of swallowing underwear, a Persian cat determined to expose her owner’s lover as a gold digger, and the allure of a feisty, pretty waitress from the local diner, Cyrus gets caught up in a new community and its endearing residents, both human and animal. Sensing he may have misjudged the past, he begins to realize it’s not just his patients that need healing. 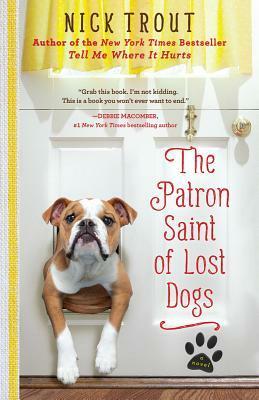 If I’m being truly honest, I’m not really a dog person, so I wasn’t too convinced The Patron Saint Of Lost Dogs was a book I was going to get a lot out of and I was surprised to find that I actually did become interested and sometimes quite attached to the dogs and other animals in this book. In fact, I was far more interested in the pets than in the main character. The Patron Saint of Lost Dogs is a bit of a slow starter- Cyrus wasn’t very engaging and I was even leaning towards actively disliking him when his connection to the animals began to come out. He never reached being a warm character but once he began to treat the animals he did become personable. Because of his past strained relationship with his father and the prior loss of his mother there’s nothing at all tying him to this town he’s been drawn back to and it showed in the novel. My interest in any of the people was only slight, with the exception of Lewis who becomes the father figure Cyrus needed. I wish the people had been given more storyline and more play and there had been something more concrete drawing the book together. The Bedside Manor patients were great and had personalities of their own though, I really enjoyed Trout’s obvious veterinary knowledge and how it was sprinkled throughout the novel without being heavy. Although I didn’t dislike the book I did find it difficult to become attached to anyone and though I think the history with his parents was well explained, and worth reading the novel for (obviously it goes to show how much talking with your children and maintaining a relationship is important for human development) it just didn’t carry the plot enough to make it one of my top reads. Thank you to Hyperion for our review copy. All opinions are our own.